My research program is centered on translating findings from cognitive, affective, and social neuroscience into novel interventions (e.g., mindfulness training) that effectively target transdiagnostic mechanisms underpinning stress-related, biobehavioral conditions such as addiction, chronic pain syndromes, and emotion dysregulation. I have a broad background in interdisciplinary clinical research on psychosocial interventions for stress-related conditions, with specific training and expertise in biobehavioral research methodologies. I was trained in intervention research at the University of North Carolina at Chapel Hill, where I completed my PhD in Social Work and was awarded Ruth L. Kirschstein pre- and post-doctoral fellowships in integrative medicine from the National Institutes of Health to conduct clinical trials at the University of North Carolina at Chapel Hill School of Medicine. Targeting Hedonic Dysregulation to Address Chronic Pain and Opioid Misuse in Primary Care (NIDA R01. PI: Garland). Prescription opioid misuse is a public health threat that is being addressed with heightened urgency at both clinical and policy levels. In primary care settings, where chronic pain is commonly treated with long-term opioid therapy, as many as one-in-three chronic pain patients misuse opioids, evidenced by aberrant drug-related behaviors such as dose escalation or use of opioids to self-medicate negative emotions. According to a 2015 NIH-AHRQ systematic review of long-term opioid therapy for chronic pain (Chou et al., 2015), research on risk mitigation strategies for opioid misuse among chronic pain patients is virtually nonexistent. Extant therapies for opioid misuse and chronic pain may have limited efficacy because they fail to directly target the maladaptive emotion-cognition interactions and hedonic dysregulation inherent in these co-occurring problems. To meet this need, the PI developed a novel behavioral intervention, Mindfulness-Oriented Recovery Enhancement (MORE). MORE is innovative in that it aims to modify associative learning mechanisms hijacked during the allostatic process of opioid misuse by strengthening top-down cognitive control to restructure bottom-up reward learning from valuation of drug reward to natural reward – something that no other behavioral intervention for opioid misuse has been designed to do. The goal of the proposed study is to conduct a full-scale RCT of MORE to reduce aberrant drug-related behaviors and chronic pain among opioid misusing patients in primary care. Participants will be randomized to 8 weeks of MORE or a conventional support group control. Patient-reported outcomes will be assessed pre- to post-treatment and through a 9-month follow-up; this data will be triangulated through physician evaluation, urine toxicology, and medical records. Design features of this hybrid study draw upon complementary strengths of Stage II and Stage III research as defined by the NIH Stage Model (Onken et al., 2014) maximizing internal validity, intervention potency, and fidelity assurance with research therapists while maximizing external validity by administering the intervention in community clinics – the setting where the majority of chronic pain patients seek health care. The proposed project will elucidate cognitive, affective, and autonomic mechanisms mediating the therapeutic effect of MORE on aberrant drug-related behavior and pain, and will examine psychiatric and psychophysiological moderators and predictors of treatment response – including an innovative biomarker representing the relative salience of drug and natural reward. Ecological momentary assessments of pain, craving, and affective states will be correlated with opioid dosing data and therapeutic skill practice to reveal how MORE modulates symptoms and opioid misuse in everyday life. This translational research proposal from a New Investigator could significantly reshape the treatment of prescription opioid misuse among chronic pain patients by targeting top-down and bottom-up mechanisms underlying these intersecting issues and advancing evidence-based integration of behavioral health into primary care. Targeting Co-Occurring Disorders in the Community with Mindfulness-Oriented Recovery Enhancement (DOD Clinical Trial Award. PI: Garland). This research project will help active duty service members and Veterans with chronic pain and stress who are at-risk for opioid misuse, and will also inform the treatment of civilians with similar issues. Should MORE prove to be effective in a community-based context, within two years following completion of the proposed project it could be easily transported into military installations and Veterans Administration Medical Centers in the U.S. and around the world, as well as in communities where no major military medical center is present. In these settings, MORE could be offered as a form of standard integrative health care provided to service members and Veterans. A secondary objective of the proposed project is to utilize lab-based assessments and mobile technology to understand how MORE works to create therapeutic change, and to predict whether and when service members and Veterans are at risk for relapsing back to opioid misuse. To accomplish this objective, lab-based assessments will evaluate physiological reactivity to cues associated with past episodes of pain and opioid use, and a smartphone-based assessment will be used to evaluate opioid craving, pain, and negative mood in “the real world.” Because changes in heart rate and other physiological factors may indicate the extent to which a person’s brain has been triggered by opioid craving, this application of mind-body assessments to predict opioid misuse risk and treatment outcomes could facilitate early risk detection and penetrate denial. Effects of Mindfulness-Oriented Intervention on Endogenous Opioid Mechanisms of Hedonic Regulation in Chronic Pain (NCCIH R61/R33. PI: Garland. Co-PI: Zubieta). Chronic pain is typically managed with extended use of opioid analgesics, despite an absence of data on their long-term efficacy and clear evidence of significant health risks. Prolonged opioid use dysregulates the endogenous opioid system, disrupting hedonic homeostasis in the brain and resulting in hyperalgesia, stress reactivity, and reward insensitivity – factors that exacerbate chronic pain and increase risk for opioid misuse. Thus, chronic pain patients receiving extended opioid therapy suffer from impaired regulation of aversive (e.g., pain) and appetitive experience (e.g., pleasure), dual processes subserved by opioid-mediated, hedonic regulatory mechanisms. However, according to a 2015 NIH systematic review, there are no interventions with proven efficacy for improving outcomes among chronic pain patients on long-term opioid therapy. Extant therapies may have limited efficacy because they fail to directly target the neural circuits of hedonic regulation. In contrast, meditation-based interventions, which have been conceptualized as means of self-regulating hedonic function, may hold promise for addressing this public health concern. The overarching aim of this proposal is to determine the capacity of a novel meditation intervention, Mindfulness-Oriented Recovery Enhancement (MORE), to restore endogenous opioid system function as measured with PET and a selective μ-opioid radiotracer. In the R61, we will compare the effects of MORE to a support group (SG) control on measures of endogenous opioid system function during sustained muscle pain, and will use fMRI and behavioral measures to assess whether changes in opioid function are associated with improved regulation of appetitive (reward) and aversive (pain) experience among chronic non-neuropathic back pain patients (CNBP). In the R33, we will further validate the opioid functional mechanism by examining the A118G allele of the μ-opioid receptor gene (which has been linked to low μ-opioid function, hyperalgesia, and insensitivity to opioid analgesia) as a moderator of MORE’s effects on the endogenous opioid system, fMRI measures of natural reward responsiveness, and clinical outcomes – including pain and opioid use. Furthermore, to refine our understanding of how the intervention modulates these neural mechanisms, the R33 will assess the dose of meditation skill practice as a predictor of changes in endogenous opioid function and clinical correlates. This multi-PI proposal unites expertise in meditation-based interventions with expertise in neurogenetics and the use of PET and fMRI to probe the neurobiological mechanisms of pain and affective experience, and builds upon a program of prior research which provided preliminary efficacy data on the MORE intervention and standardized its delivery via manualization of the treatment and development of fidelity measures. By elucidating a key mechanism of this meditation-based intervention, the proposed translational research will enable rapid optimization of MORE for Stage III clinical trial implementation and dissemination, allowing us to provide a timely solution to this public health problem of escalating significance. Mindfulness and Positive Emotion Regulation. I am pursuing experimental research in the laboratory, as well as observational studies and clinical trials, to explore the effects of mindfulness on positive emotion regulation. Specifically, I am interested in how mindfulness and related psychological factors may influence two key positive emotional processes: positive reappraisal coping and savoring. These forms of positive emotion regulation are closely linked to mental health and well-being. 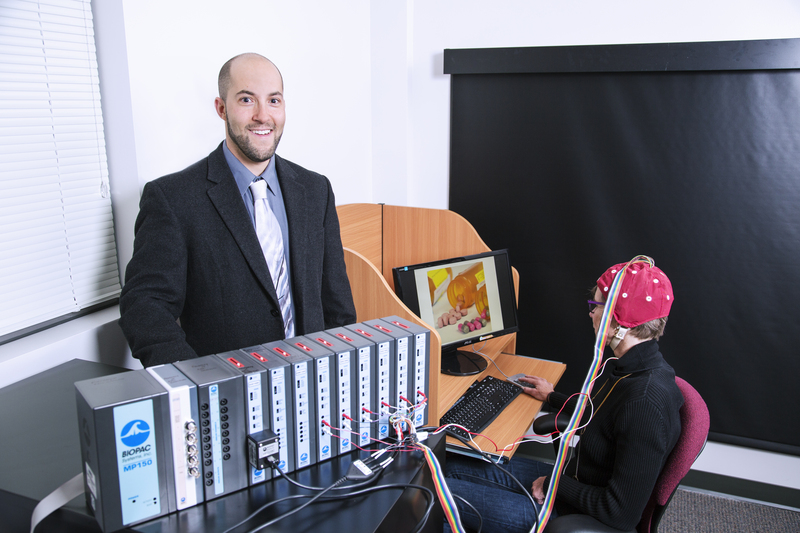 Finding ways to promote these processes may be the key to ameliorating conditions that involve reward dysregulation (i.e., being unable to receive pleasure healthful objects and events in the natural environment – think smiling babies and sunsets) such as addiction and chronic negative mood states. This line of research informs my theory development efforts. Cognitive, Affective, and Psychophysiological Mechanisms in Health and Mental Health. I also study basic cognitive, emotional, and psychophysiological processes implicated in mental health problems and addiction. For instance, I conduct research on the attentional bias – that is, the phenomenon by which people more rapidly detect and focus on objects and events that are congruent with their current mood than those that are not congruent with their current emotional state. Thus, individuals in a negative mood state tend to pay attention to objects, persons, and events that they construe as disappointing, upsetting, or frightening, while overlooking or ignoring what is beautiful, affirming, or pleasurable. Attentional bias is particularly evident in addiction when addicts are “triggered” and find their attention automatically captured by drug-related cues (such as the sight of a cigarette, pill, or bottle of liquor) even when they want to stay clean and sober. I am also interested in studying how the brain modulates the heart beat when people are paying attention to emotional stimuli and experiences. My studies and the studies of others have shown that rapid, beat-to-beat changes in heart rate, known as heart rate variability, are significantly associated with emotional states and degree of mental focus. Mind-Body Interventions in Supportive Oncology and Survivorship. As Associate Director of Integrative Medicine in the Supportive Oncology and Survivorship Program of the Huntsman Cancer Institute, I have begun research on the therapeutic effects of mind-body interventions for cancer and their mechanisms of action. New research efforts are focused on mindfulness training, yogic breathing, guided imagery, and clinical hypnosis, among other interventive techniques. This area of research is particularly fertile ground for studies on the cognitive, affective, and psychophysiological pathways linking mindfulness to positive reappraisal coping, the capacity to find meaning and purpose in the face of adversity.